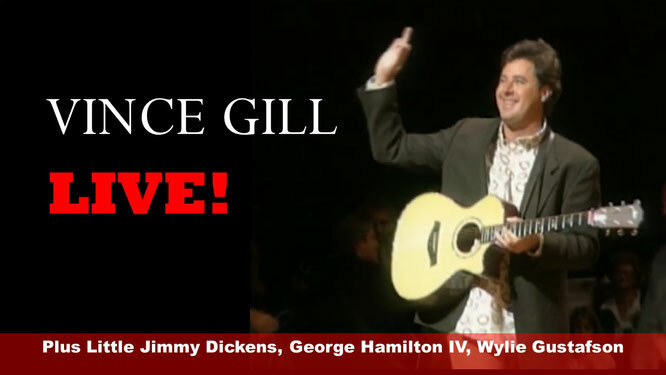 Vince Gill Live! Plus Little Jimmy Dickens, George Hamilton IV & Wyllie Gustafson. Full Show! - Newhillbilly website. 100% American Roots Music. He has recorded more than 20 studio albums, charted over 40 singles on the U.S. Billboard charts as Hot Country Songs, and has sold more than 26 million albums. He has been honored by the Country Music Associationwith 18 CMA Awards, including two Entertainer of the Year awards and five Male Vocalist Awards. As of 2017, Gill has also earned 21 Grammy Awards, more than any other male country music artist. In 2007 he was inducted into the Country Music Hall of Fame. On February 4, 2016 Gill was inducted into the Guitar Center Rock Walk by Joe Walsh of the Eagles. In 2017, Vince Gill and Deacon Frey were hired by the Eagles to fill-in for the late Glenn Frey. George Hege Hamilton IV (July 19, 1937 – September 17, 2014) was an American country musician. He began performing in the late 1950s as a teen idol, later switching to country music in the early 1960s. On February 8, 1960, Hamilton officially became a member of the Grand Ole Opry. Hamilton's breakthrough hit was the 1961 song "Before this Day Ends". His biggest hit came two years later with "Abilene", another song penned by Loudermilk and Bob Gibson. The song spent four weeks at No. 1 on Billboard's country singles chart and reached the Top 20 of the Hot 100. Wylie Galt Gustafson (born June 7, 1961, Conrad, Montana) is an American singer-songwriter who has toured nationally and internationally with his band, "Wylie & The Wild West". The band is known for its blend of cowboy, traditional country, folk and yodeling.